Rock solid, stiff & secure grip Easy to fit - no need to remove tape/grips/levers etc., simply opens up and you bolt on with an alien key. This is not the inferior cheaper style that snaps when you do this, or in cold weather! Sits in front of your stem/bar so you can look at your Garmin easily, keeping your eyes on the road/trail as well. Compatible with computers with 1/4 turn twist lock interface. Basically it's used for Garmin with 1/4 turn twist lock surface. Note: The original clamp size of this GPS mount is 31.8mm. You have to insert thicker spacer to make it fit 25.4mm. 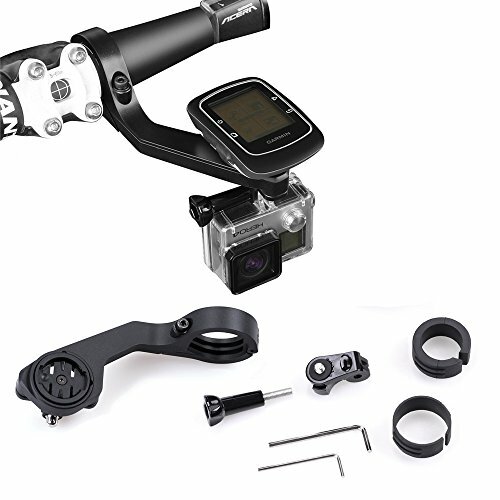 Note: Garmin Edge GPS, Sports camera and other accessories are not included. Compatible with Garmin Edge series 25 200 500 510 520 800 810 1000 GPS. Rock solid, stiff & secure grip. This is not the inferior cheaper style that snaps when you do this, or in cold weather! Kit pieces: 7pcs. 1 year Warranty. Get Full refund or new replacement for any quality problem. If you have any questions about this product by Koroao, contact us by completing and submitting the form below. If you are looking for a specif part number, please include it with your message.